Champion Oil, a recognized leader in purpose-built lubricants and a corporate sponsor of the 2012 Great Race, is participating with three teams of drivers and navigators in the vintage and collector car competitive rally that tours the Great Lakes. The Great Race starts in Traverse City, Michigan. From there, it will run north along Lake Michigan to the Upper Peninsula, cross into Canada at Sault Ste. Marie, then travel east along the north shore of Lake Huron, south toward Lake Ontario and east toward the crossing back into the United States at Thousand Islands, then back west along the south shore of Lake Erie and toward its finish line in the Detroit area. In all, the race will cover 2,200 miles, cross four states and one Canadian province, and afford sights of all five Great Lakes. 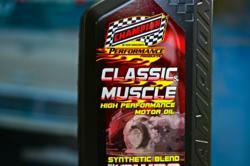 Champion “Classic & Muscle” Motor Oil is built specifically to meet the lubrication demands of hot rod, street rod, classic and muscle car engines, especially those using flat tappet and roller cams operating at high RPMs and requiring high-pressure valve springs. To meet these demands, Champion utilizes its premium ZDDP anti-wear protection package, which contains a unique balance of chemistry that includes high levels of zinc and phosphorus. In addition, all Champion “Classic & Muscle” Motor Oils contain an exclusive TVS® (Thermal Viscosity Stabilizer) technology. This proprietary technology delivers unmatched film strength at high temperature, better piston ring seal for maximum compression, and increases horsepower and torque in most engines.